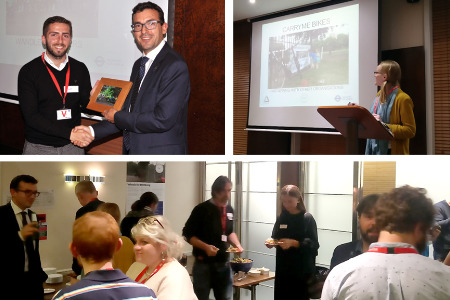 Last week we celebrated the achievements of this year’s Cycling Grants London awardees with an evening of sharing stories and ideas. This year’s projects have helped London's diverse communities cycle more often and more safely through a range of schemes – from guided rides and bike maintenance courses, to cycle training, bike lending and even creating custom bikes for those with mobility issues. And with 6,120 people reached, there was a lot to celebrate! London’s Walking and Cycling Commissioner, Will Norman, joined us to thank the awardees for their hard work. He set out his vision for London as a cycle-friendly city, where cycling is a normal part of everyday life. To make this a reality, he said, we need to break down the barriers to cycling, and give people the confidence and skills to get on their bikes – something that all of the Cycling Grants London projects are helping to achieve. We also heard presentations from some of the awardees, who shared their experiences, challenges and successes with the group. Geoff Fletcher spoke about what he learned from setting up Becontree Cycle Centre, a community-focused cycle shop that aims to make bike ownership more affordable. The centre reconditions donated and discarded bikes and sells them at reduced prices, as well as running bike maintenance training sessions for the local community. Geoff’s advice was to never go it alone: work with partners, such as local authorities and local businesses, and share ideas with others. Alix Stredwick of CarryMe Bikes spoke about their Family Cycling Project. Having small children can present challenges to getting around by bike, but the Family Cycling Project wants to make it easy and normal. They run guided rides for families and operate a Family Cycling Library, which lends out cargo bikes and cycling kit to give more families access to the equipment they need. Alix stressed how helpful social media has been for getting the word out to potential participants. Claire Williams told the group about the Limehouse Women’s Cycling Project, a female-only bike club for women who would like to learn how to cycle and gain basic bike maintenance skills. Claire explained how the project engaged women from the Bangladeshi community who hadn’t previously thought of cycling as a mode of transport – and how some participants are now eager to lead rides of their own! Three projects were presented with awards on the night to recognise special achievements. Wheels for Wellbeing won an added value award for their project providing side-by-side tandem cycling sessions for dementia sufferers. The project also engaged students who have been excluded from mainstream schools to act as cycle pilots, helping them to build confidence and responsibility. A participant in the Limehouse Women’s Cycling project won the best blog award for her reflections on learning to cycle. And the Wandle Wheelers project won the best photo award for a picture of families and cyclists of all ages taking part in one of their guided rides. The achievements of this year’s projects have been amazing. The numbers speak for themselves: 463 bikes refurbished, 263 rides organised and 1,016 people gained new bike maintenance skills! And hearing the personal experiences of this year’s awardees shows how valuable it is to have a network of projects and people who can support and help each other to make London a city where everyone has the opportunity to cycle. It will be exciting to see how this year’s projects grow and develop in the future.